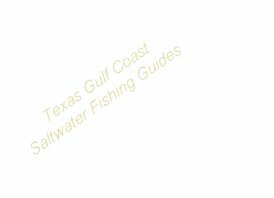 Saltwater sportsman, fishermen and hunters, fish or hunt with the best Guides along the Texas Gulf Coast. The quick reference Directory below lists fishing guides and charters according to the area they fish. Fishing Guides...Not yet included on this site..?? Click Here for Signup information. - Fishing Guides for Sabine Lake are here....Click Here! Just click on the "maps" above to locate the guides for your specific Area. information on use of this domain. Signing up is quick and easy. Just go to our Registration Page and to the signup form....See how easy it is to be part of SaltwaterFishingGuides.com! Thanks!